+ Improved battery charging status indicator. + Smoother transition for camera and camcorder functions. + Redesign of weather widget icons. + Faster Exchange ActiveSync® email loading. + Streamlined organization of newly downloaded applications. + Organized favorite contacts by call count. + Updated Bluetooth® connection for enhanced video sharing experience. + Coordinated date and time across phone displays. + Cleaner looking status bar for GPS symbol. + Improved sync capabilities for 3G Mobile Hotspot. + Faster Visual Voice Mail loading. 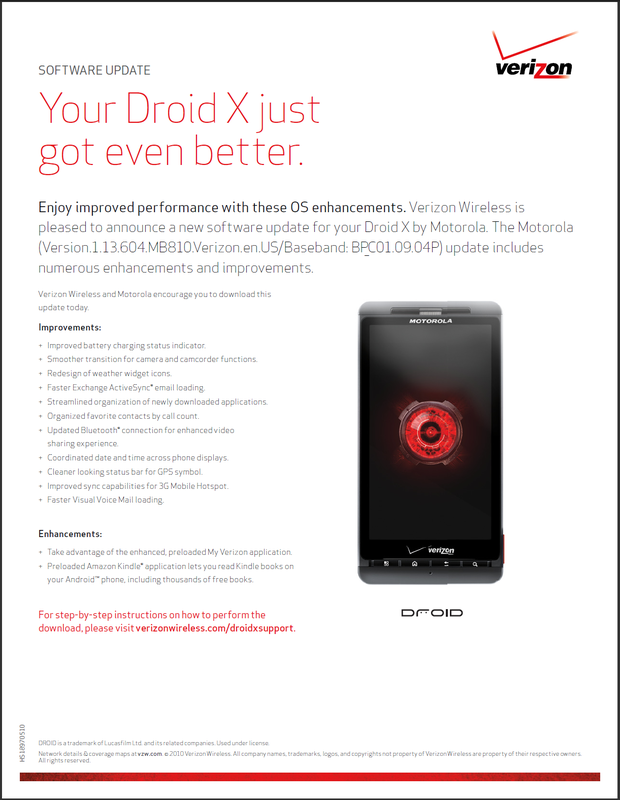 + Take advantage of the enhanced, preloaded My Verizon application. + Preloaded Amazon Kindle® application lets you read Kindle books on your Android™ phone, including thousands of free books. All sounds great to me. Definitely interested to see how a Kindle book looks on this 4.3″ beauty. And no, this is not Froyo. We’re still expecting that in August.